Quantity : 1set of 9pcs. Ball end inserts into a screw at a 25° angle. Superior ball end strength and working angle. Model No :17099. Weight . Quantity : 1set of 5pcs. Model No :13148. Made in U.S.A. Weight . Quantity : 1set of 7pcs. Ball end inserts into a screw at a 25° angle. Standard : 5/64", 3/32", 7/64", 1/8", 9/64", 5/32",3/16". Model No :10945. Made in U.S.A. Weight . Quantity : 1set of 7pcs. Standard : Hex : 1.27mm, 1.5mm, 2mm, 2.5mm, 3mm, 4mm, 5mm. Tools are made in the USA with Bindhus proprietary protanium steel and are up to 20% stronger than competitor tools. Quantity : 1set of 9pcs. Standard : 1.5mm, 2mm, 2.5mm, 3mm, 4mm, 5mm, 6mm, 8mm, 10mm. Ball end inserts into a screw at a 25° angle. Model No :10999. Made in U.S.A. Weight . Quantity : 1set of 9pcs. The Stubby short arm eliminating the need to cut off the short arm and a smaller inside radius for tight spaces. Standard : 1.5, 2, 2.5, 3, 4, 5, 6, 8, 10mm. Model No :16599. Quantity : 1set of 12pcs. Ball end inserts into a screw at a 25° angle. 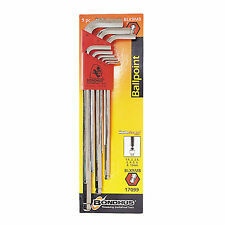 Tools are Made in the USA with Bondhus proprietary Protanium® steel and are up to 20% stronger than competitor tools. Made in U.S.A. 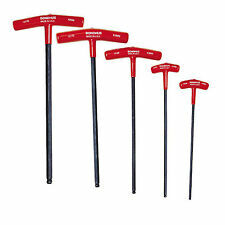 The non-magnetic ProHold tip holds screws snug on tool and does not interfere with tool rotation. Quantity : 1set of 9pcs. Standard : 1.5, 2, 2.5, 3, 4, 5, 6, 8, 10mm. Ball end inserts into a screw at a 25° angle. Standard : Hex : 3/32", 7/64", 1/8". Included tool stand can be wall or bench mounted. with Stand. Model No :13190. Quantity : 1set of 8pcs. Weight : 1,680g. Made in U.S.A. Quantity : 1set of 9pcs. Standard : 1.5mm 2mm 2.5mm 3mm 4mm 5mm 6mm 8mm 10mm. Ball End inserts into screw at a 25º angle. Extra long length available. Quantity : 1set of 8pcs. Ball end inserts into a screw at a 25° angle. Model No :10932. Made in U.S.A. Weight . Quantity : 1set of 9pcs. Standard : 1.5mm, 2mm, 2.5mm, 3mm, 4mm, 5mm, 6mm, 8mm, 10mm. Ball End inserts into screw at a 25º angle. Superior Ball End Strength and working angle. Model No :16099. Quantity : 1set of 7pcs. Standard : 1.5mm, 2mm, 2.5mm, 3mm, 4mm, 5mm, 6mm. Ball end inserts into a screw at a 25° angle. Model No :10992. Made in U.S.A. Weight . Quantity : 1set of 6pcs. 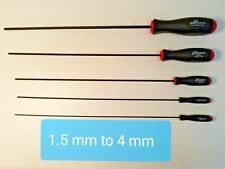 Standard : 1.5mm, 2mm, 2.5mm, 3mm, 4mm, 5mm. Ball end inserts into a screw at a 25° angle. Model No :10946. Made in U.S.A. Weight . Quantity : 1set of 6pcs. Model No :13146. Made in U.S.A. Weight . Quantity : 1set of 9pcs. Standard : Hex : 1.5mm, 2mm, 2.5mm, 3mm, 4mm, 5mm, 6mm, 8mm, 10mm. Tools are made in the USA with Bindhus proprietary protanium steel and are up to 20% stronger than competitor tools. Quantity : 1set of 8pcs. Standard : Hex : 2mm, 2.5mm, 3mm. Ball-Point : 4mm, 5mm, 6mm, 8mm, 10mm. Included tool stand can be wall or bench mounted. with Stand. Model No :13189. Weight : 1,440g. Quantity : 1set of 13pcs. Ball end inserts into a screw at a 25° angle. 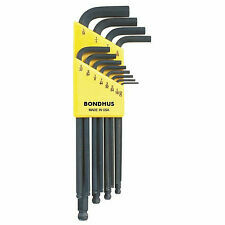 Tools are Made in the USA with Bondhus proprietary Protanium® steel and are up to 20% stronger than competitor tools. Made in U.S.A.
UltraGuard Rough surface improves grip. Tools won't slip even when hands or tools are oily. Quantity : 1set of 9pcs. Length : 10mm - 265mm Super Long. Standard : 1.5mm, 2mm, 2.5mm, 3mm, 4mm, 5mm, 6mm, 8mm, 10mm. No screw will be out of reach! I recall losing an airplane because I was too lazy to take the cowl off to check the tightness of the engine mounting bolts. Well long story short, the engine mounting bolts were loose and I lost the plane. Bondhus 13189 (2 - 10mm). Bondhus USA 13189. Bondhus Corporation. This set includes: 2mm hex end, 2.5mm hex end, 3mm hex end, 4mm ball end, 5mm ball end, 6mm ball end, 8mm ball end & 10mm ball end. Monticello, MN 55362. 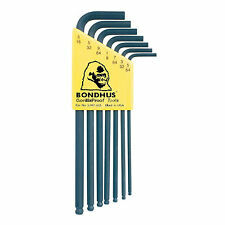 Bondhus® USA #32434. 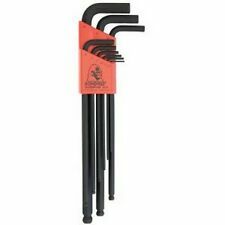 Bondhus® USA Gorilla Proof TR9 - TR40 Long Arm Tamper Resistant Torx®/Star Tip L-Wrenches Set 8pcs with ProGuard™ Corrosion Resistant Finish. 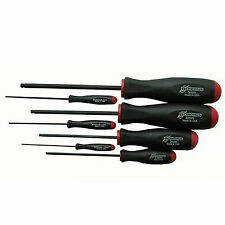 This Set Includes These 8 Tamper Resistant Torx® Sizes. 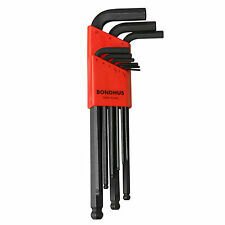 Bondhus® USA #32432. Bondhus® USA Gorilla Proof TR6 - TR25 Long Arm Tamper Resistant Torx®/Star Tip L-Wrenches Set 8pcs with ProGuard™ Corrosion Resistant Finish. TR6, TR7, TR8, TR9, TR10, TR15, TR20 & TR25. BONDHUS CORPORATION. Note: Image is for reference only, actual product may vary slightly depending on your vehicle. Tools are Made in the USA with Bondhus proprietary Protanium steel and are up to 20 percent stronger than competitor tools. Angle entry up to 25 Degrees on sizes 1.5mm, 2mm, 2.5mm, 3mm, 4mm, 5mm, 6mm, 8mm, 10mm. 9pc Set BallDrv L-Wr 1.5-10M BND10999 Brand New! Part Number: 10999 BND10999. Hex Ball End Wrench Set, 9 Piece, 1.5mm to 10mm, Long, L Shape, in Twist-to-Lock Plastic Case. We have warehouses in multiple states. We will provide you with that information. Ball head in unmatched strength and ArbeitsswinkelBondhus 16592 7pc Stubby ProGuard Hex Set 1.5-6mm, 16592. Stubby function-headed offset screwdriver bits for hard to reach screws where conventional fail tools.